EUTECT will be introducing its standard laser soldering system for the first time to the professional public at productronica 2015. Both an inline solution for fully automatic production and a stand-alone solution with the smallest possible footprint are being introduced. ‘We want to offer our laser soldering systems to the customers as a standard solution with which they can react to production orders quickly and flexibly’, says Matthias Fehrenbach, managing director of EUTECT GmbH, describing the product philosophy. Here the machines should cover the spectrum of fully automated serial manufacturing to the individual production of small series and prototypes. The SWF LL S151 inline is intended to serve as a fully automatic, serial manufacturing machine in this connection. The machine is equipped with a controlled wire feed and a 100 W diode laser. The amount of wire and wire slip are monitored via a rotary encoder control wheel. The wire roll holder is flexibly aligned so that various wire roll positions as well as roll diameters can be set. The work angle can be freely selected here. The controlled wire feed regulates or, if necessary, stops the wire feed as soon as it encounters a resistance or has to impact with a specific force. The wire feed’s patented action-reaction principle enables this. Wire kinking is avoided via this principle and component and handling tolerances are adjusted for. Likewise, reference points are specified here in order to transport controlled, reproducible amounts of wire in a regulated manner. The wire is introduced into the soldering process in a stable, controlled manner via this intelligent sensor technology. Maximum process safety is thus always guaranteed. The C6 controller can record all of the process steps here, which enables 100% data capture in terms of traceability. In addition to the regulated wire feed, the SWF LL S151 is equipped with a laser-class-4 diode laser of up to 100 W with a wavelength of 980 nm ± 10 nm. The entire system is air cooled. A pilot laser for setting up the machine is also integrated, as is a pyrometer for investigating the optimal process temperature. The temperature can be controlled in real time thanks to this surface measurement. Great reproducibility and high quality can be achieved that way, and the components are exposed to only minor stress. The operator can preset the temperature curve over time or the pure laser power when setting up the laser. All of the temperature profiles are freely configurable in order to achieve a more controllable process and to optimize production cycle time. A process camera mirrored into the optical path enables rapid setup as well as optimal process visualization. Tooling time and the accompanying costs can be reduced thereby. All operating data are recorded in order to derive inferences about all process-influencing quantities. Traceability as well as maximum process safety (temperature, laser power, force, wire quantity, speed, and time) are thus guaranteed. Moreover all of the process data can be simply integrated across the automation interfaces into the infrastructure on the customer’s side whereby integration costs are saved. Process monitoring occurs in real time thanks to the extremely fast machine software. The SWF LL S151 consists of a laser safety cell and a continuous conveyor belt with associated light barriers and indexer stations. The automation cell is equipped with highly dynamic X-Y-Z axis kinematics and a lift-and-locate rotary module. In addition to the SWF LL S151, EUTECT is also introducing the SWF LL XS 800 in the area of laser soldering at productronica. A table system with an 800 mm x 1060 mm footprint is involved here. 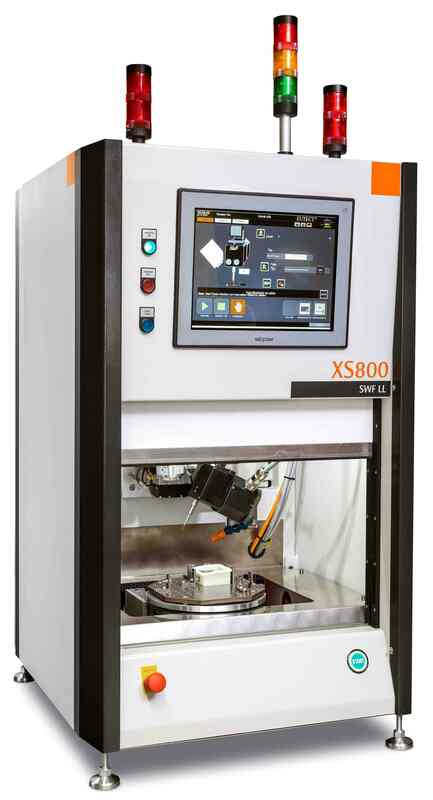 The LL XS 800 is also equipped with the same wire feed and the same laser as the fully automated SWF LL S151. The machine’s set-up, the recording of operating data, and process monitoring are done as with the inline version. ‘The machine’s size as well as its stand-alone concept make it an ideal process solution for small and mid-sized EMS companies that have to complete challenging soldering tasks with smaller piece counts’, explains Fehrenbach. Both machines are offered to the customer as finished machine packages. EUTECT isn’t targeting the automobile industry’s high-volume supplier here, but instead would like to address customers individually who to date have been able to complete soldering tasks with standard machines. ‘We’re talking here about the finishing of complete systems, and this also includes complex soldering tasks’, explains Fehrenbach. Solutions going beyond current soldering standards are necessary for this task. EUTECT transfers experiences collected in the special solder area and packs them into complete packages at an attractive price-performance ratio.